Climate Action, February 21: New standardised labels to reduce food waste in the U.S. The Christian Science Monitor, February 16: Can new labels take a bite out of food waste? Emily Broad Leib, director of the Harvard Law School Food Law and Policy Clinic, appeared on the Thursday, February 16 episode of CBS This Morning. She spoke about the new initiative to standardize date labels on food packages, spearheaded by the Food Marketing Institute (FMI) and Grocery Manufacturers Association (GMA) and informed by research conducted by FLPC and the Natural Resources Defense Council. Originally published by USA Today on February 14, 2017. Written by Matthew Zahnzinger. You’re cleaning out your fridge and pantry, amazed at just how big the pile of stuff you’re going to throw out is—solely because it’s gone past its expiration date. Because if it’s past its expiration date, it’s gone bad, right? Wrong! Well… maybe. In the interest of saving you some money and cutting down on food waste, we’re here to dispel some common myths behind those pesky expiration dates, and walk you through some tips and tricks for checking if your food is still good to eat. Did you know that there’s no national regulation detailing what expiration dates actually mean? According to a 2013 study from the Harvard Law School Food Law and Policy Clinic—called The Dating Game—there is significant inconsistency in food labeling which leads to unnecessary food waste. We talked to study lead author and Harvard Law professor Emily Broad Leib back in 2015. “It’s up to the discretion of the manufacturer,” she said. “These dates were not intended to promote safety. Instead, manufacturers use them to relate more to taste or quality. It’s just that consumers don’t interpret them that way.” Expiration dates often reflect taste, not safety or nutritional value. Let that sink in: Expiration dates often reflect taste, not safety or nutritional value. That’s why you see so many different iterations, including “Sell By,” “Use By,” “Best By,” and even “Best Flavor By.” And a product that’s past any one of those dates might be perfectly safe to eat. Broad Leib and her co-authors recommend a series of new labeling guidelines. But until that happens, how do you know if your food is safe to eat? Well, use your eyes and nose—and follow your gut. Open the lid and sniff it. If it smells fine and it was stored properly, it’s likely okay to eat. It might not be as tasty as it would be if you ate it before the “expiration date” but odds are good that it’s perfectly safe. Conversely, don’t let your eyes fool you when it comes to fresh food like produce. Bumps or bruises don’t mean something is ruined. After all, farmers have to throw out literal tons of food every year because it doesn’t look like what you see in those flawless supermarket ads. It might sound obvious, but you can also save food by freezing it. If you can’t use your bread or produce before it goes bad, freeze it and then cook it thoroughly when thawed. After all, it doesn’t matter how your spinach looks if you’re just going to sauté it. Fresh foods like deli meat and baked goods that aren’t shelf stable run a higher risk of spoilage. However, something like dehydrated beans or canned vegetables can last a long time. When we interviewed Doug Rauch, a former president at Trader Joe’s who opened the nonprofit grocery store The Daily Table, he told us that canned food lasts a lot longer than you might think. “Canned meat or fish can last for decades,” he said. “More acidic foods like tomatoes can cut that back, but it’s still good for a long time.” Even a can that’s started to rust should still be okay, as long as it isn’t bulging and the seal is intact. Now, there will obviously be exceptions. If a can’s seal has lost its integrity, or if plastic packaging has been torn and there’s evidence of bugs or rot, throw it out. But if not, then it’s likely going to be good for a long time. So there you have it. That little date stamped on your pasta isn’t gospel—just a guideline. Food companies want people to eat their food when it tastes best, and while we aren’t inclined to go after food that’s kinda funky when there’s a better choice, a proper understanding of “expiration” dates could drastically cut down on food waste—not to mention wasted money out of your pocket. So remember: check the packaging, use your senses, cook food thoroughly, and don’t let the perfect become the enemy of the good. Now if you’ll excuse us, we’re off to make a sandwich with a bruised tomato and some 10-year-old canned tuna. The Harvard Law School Food Law and Policy Clinic (FLPC) is thrilled to share that the Food Marketing Institute (FMI) and Grocery Manufacturers Association (GMA) today launched a new initiative to standardize date labels on food packages. The voluntary initiative encourages retailers and manufacturers to only use one of two standard phrases on consumer facing food packing. “BEST if Used By” will be used to describe a product’s quality. According to a national survey published by FLPC, the National Consumers League, and the John Hopkins Center for a Livable Future “best if used by,” is the phrase most easily understood by consumers as an indicator of quality. “USE By” will be used only for the few products that carry a food safety risk that increases past the date. According to the same national survey, “use by,” is one of two phrases most easily understood by consumers as an indicator of food safety. 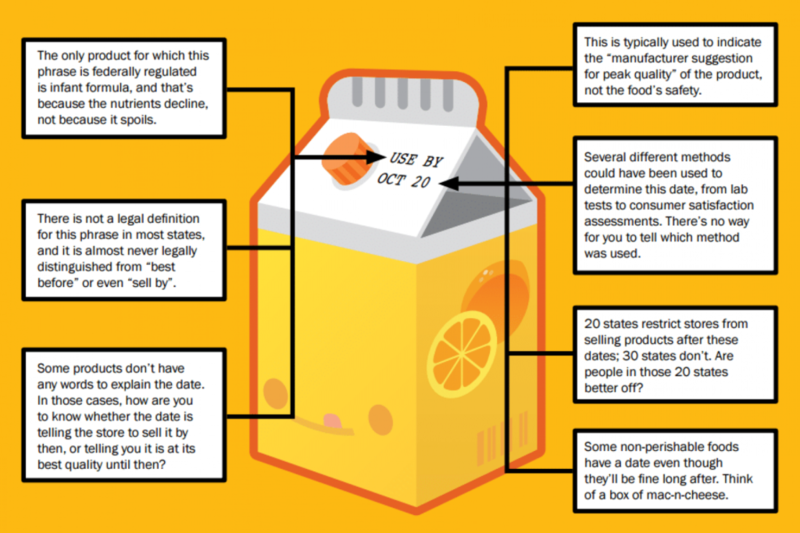 Clarifying and standardizing date labels on food products has been shown to be one of the most cost-effective ways to reduce the unnecessary waste of healthy, wholesome food. This new industry announcement follows the recommendations FLPC has advocated for the past several years. In 2013, FLPC and the Natural Resources Defense Council published The Dating Game, which examined the legal and policy regime surrounding expiration dates on foods, and exposed how unclear and unregulated date labeling contributes to an alarming amount of unnecessary food waste. In 2015, FLPC and Racing Horse Productions released the short film Expired? Food Waste in America, which profiled the waste of milk in Montana to illustrate the issue of misleading food date labels as a leading cause of food waste in America and call for a unified date labeling system as a solution. FLPC has also worked with members of Congress on legislation to reform the expiration date system (the Food Date Labeling Act of 2016), as well as providing presentations and education to advocates, government agencies and food industry leaders that are working to reform the expiration date system through both policy avenues and voluntary initiatives. FLPC commends FMI and GMA on their leadership and collaboration in creating a new set of voluntary standards for date labels. This announcement is an important first step toward eliminating date label confusion and helping consumers to avoid wasting food. We hope that manufacturers and retailers across the nation will choose to utilize these standard quality and safety labels, as well as work to educate consumers about the meaning of the labels so that they can make better decisions and reduce the waste of food and money. Learn more about the GMA/FMI voluntary date label standards here. Today, Representatives Marcia L. Fudge (D-OH), Dan Newhouse (R-WA), Chellie Pingree (D-ME) and James P. McGovern (D-MA) introduced legislation intended to boost food donations across the United States. The Harvard Law School Food Law and Policy Clinic (FLPC) enthusiastically supports The Food Donation Act of 2017 (H.R. 952), which addresses key policy changes recommended by FLPC and the Natural Resources Defense Council. The Food Donation Act of 2017 enhances the coverage of the Bill Emerson Good Samaritan Food Donation Act (Emerson Act), which was passed by Congress in 1996 and promotes food donation by providing civil and criminal liability protection to food donors and food recovery organizations. The Emerson Act provides a broad base of liability protection that was intended to encourage food donations, yet donors are often unaware of the Act’s protections. Many food manufacturers, retailers, and restaurants still cite fear of liability as a primary deterrent to donating food. The Food Donation Act of 2017 will help to clarify some of the ambiguous terms in the Emerson Act and promote awareness of the Act by delegating authority over the Emerson Act to the U.S. Department of Agriculture (USDA) and directing the USDA to provide guidance and promote the Emerson Act. Further, the proposed legislation would extend liability protection in several ways that support modern food donation. For example, it would extend liability protection to donations sold at a reduced price to recipients and to certain direct donations given to those in need, which will increase efficiency, reduce costs, and enable timely use of perishable food. Organizations that sell foods at a reduced rate, like social supermarkets, can fill a need for food insecure individuals who, for various reasons, are not willing or able to qualify for government assistance or use a food pantry or soup kitchen. Direct donation allows individuals in need to pick up food from more accessible locations right at the source, such as local restaurants and grocery stores. Foodservice establishments already have to comply with food safety requirements like training and inspections, which ensures that they have the food safety knowledge to make direct donations safely. The legislation would also reduce several barriers to food donation. For example, it would eliminate labeling requirements that are not necessary for safety and clarify that donations of past-date food are protected. Often food goes to waste because it is accidentally mislabeled or past its “sell by” or “best by” date. Under the Emerson Act, donated food must meet all labeling requirements to receive protection. At the federal level, such labeling standards include name of the food, manufacturer’s address, net quantity of contents, and an ingredient list (including allergen information); however, compliance with some of these labels are not necessary to ensure that donated food is safe. For example, the ingredient list is important for safety but the net weight is not. This bill would only require donated food to bear labels that are related to safety. With regard to past date food, date labels on food are generally indicators of peak freshness; yet, many consumers, potential food donors, and state and local governments mistakenly interpret these labels as indicators of safety. This Act extends liability protection to explicitly cover such foods, thereby preventing unnecessary waste and encouraging the donation of wholesome foods that can feed families in need. By making small changes to the Emerson Act, this legislation can support big increases on the ground in terms of wholesome food donations. Approximately 40 percent of the food produced in the U.S. goes uneaten, resulting in 63 million tons of wasted food each year. Although much of this excess food is healthy and safe to eat, a significant amount ends up in landfills, instead of on the plates of those in need. Food donation provides a critical link between businesses and organizations with wholesome, surplus foods and the 42 million Americans, including 13 million children, who are food insecure. Representatives Marcia L. Fudge (D-OH), Dan Newhouse (R-WA), Chellie Pingree (D-ME) and James P. McGovern (D-MA) legislation offers the chance to both increase food security and reduce the waste of wholesome foods. FLPC is pleased to support this bill, which will clarify the Emerson Act’s coverage, expand its protection, and eliminate burdensome barriers in order to boost food donations. Follow the progress of the Food Donation Act of 2017 (H.R. 952). Today, the Food Law and Policy Clinic of Harvard Law School released Moving Food Waste Forward: Policy Recommendations for Next Steps in Massachusetts. The report follows FLPC’s October 2016 report, Keeping Food Out of the Landfill: Policy Ideas for States and Localities, a resource that provides detailed information on how states and local governments can contribute to local food waste reduction. Moving Food Waste Forward provides information and recommendations specific to Massachusetts stakeholders. In addition to information from other states, it also references ideas and recommendations that emerged from conversations with food waste experts and stakeholders from around the state of Massachusetts. The report covers tax incentives, liability protections, date labels, food safety, school food waste, the Massachusetts organic waste ban, and government support for food waste reduction. Massachusetts stakeholders can use the information in this report in order to determine key priorities for next steps in policy change to further reduce the amount of food wasted in the state. The recommendations in this report could be implemented individually or in tandem, or could be combined together into comprehensive state food waste legislation. 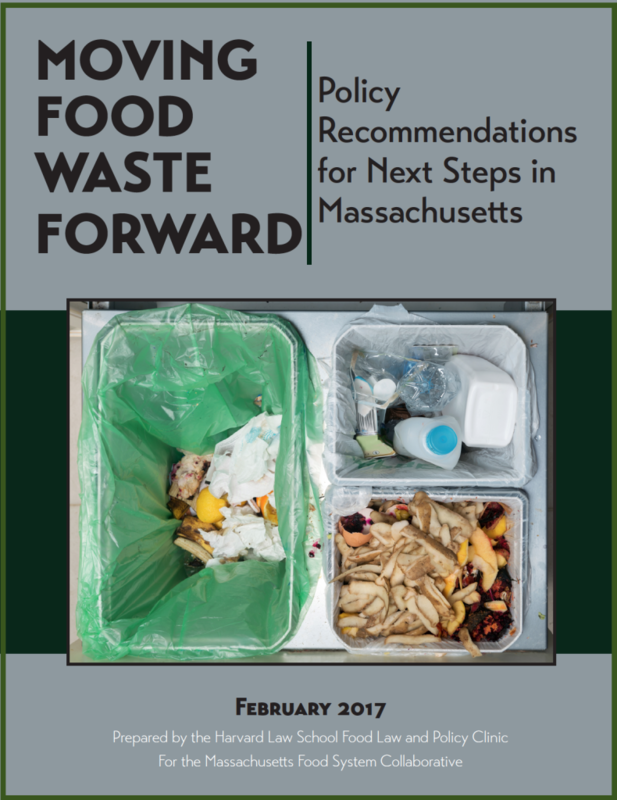 Read Moving Food Waste Forward: Policy Recommendations for Next Steps in Massachusetts.